The most rewarding aspect of my job is working with my undergraduate students and the 4-H youth throughout the Commonwealth. It was once said that a good teacher teaches, but a great teacher inspires. I try to remember that philosophy when I work with UK’s students and Kentucky’s youth. Gregg Rentfrow, a graduate of the University of Illinois Department of Animal Sciences, said his degree allowed him to marry practical knowledge with science. 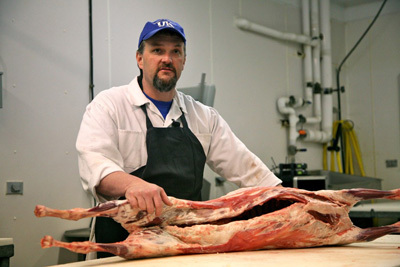 “I learn better by doing, so the hands-on experiences I received in U of I laboratories and on the meats judging and meat evaluation teams helped me tremendously,” said Rentfrow, a University of Kentucky (UK) meat science assistant Extension professor. Rentfrow said he believes his career is a calling. In addition, Rentfrow teaches a meat science class, which covers everything from growth and development to hot dogs. He also oversees more than 600 youth participating in Kentucky’s 4-H Country Ham Project and 4-H Meats Judging Contest. Rentfrow also tries to pass on the same lessons and experiences he gained at the U of I to his students.